Of all the films that have won the Best Foreign Language Film Oscar in the past decade, from Crouching Tiger, Hidden Dragon to The Lives of Others, Austria's The Counterfeiters is by far the weakest. It is a solid, competently made film, but in a year where great films like 4 Months, 3 Weeks, and 2 Days, Persepolis, and The Band's Visit were all submitted by their respective countries (Band's Visit was later disqualified), giving the title of best foreign language film of the year to a film like The Counterfeiters should raise a resounding "huh?" 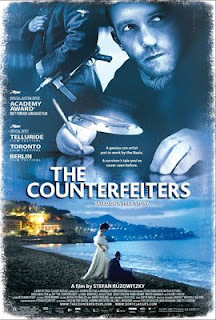 Of course, The Counterfeiters is standard Oscar fare. 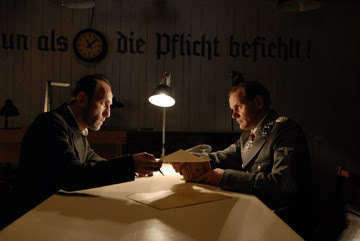 Set during WWII, it tells the true story of Salomon Sorowitsch, a master counterfeiter who is recruited by the Nazis while wasting away in a concentration camp to run a massive counterfeiting operation designed to flood the British and American economy with counterfeit money. It is an interesting story, and director Stefan Ruzowitzky handles the material well, and keeps the audience engaged throughout, but it is never anything more than middle-of-the-road fare. It is a Holocaust movie, and it fills in all the expectations of its genre, which is the kind of thing the Academy loves. But it is never on the level of Schindler's List or The Pianist. I know it sounds like I don't like the film, but I do. It is merely a good film that never rises to greatness, and to see it crowned as the best world cinema had to offer in 2007 is, to me, a slap in the face to much more daring, ambitious filmmaking. 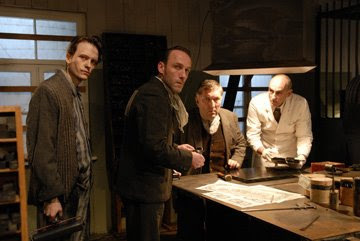 The Counterfeiters is solid all the way around - and, like The Pianist, it presents us with moral conundrums that spring from the situation the prisoners find themselves in. The counterfeiters are given much nicer accommodations than the rest of the prisoners in the camp, and they are forced to deal with the dilemma of staying alive by aiding the very people who are slaughtering their friends and families by the millions. While it is compulsively watchable, I never felt that the moral complexities were explored to their fullest extent. Sorowitsch makes for a hard, stoic hero, and I felt that Ruzowitzky could have dug deeper into his character than he did. He is juxtaposed by Adolf Burger, a young idealist determined to sabotage the Nazis' plan, and the two continually clash as the movie progresses, but I felt there were places left unexplored in their relationship and their dilemma that could have made The Counterfeiters a better film. As it stands, The Counterfeiters is well constructed historical drama - the kind of quality filmmaking our marketplace is sorely lacking - it's just not the best. And there is a very wide gap between good and great. Oh my word, I agree, it is not great, but it is not bad either. I did not think it would have deserved to win, and I still don't. I would still recommend it to anyone who has not seen it. Great review Matty. I probably would have liked it better if I had not known that it won the Oscar...knowing that this edged out "4 Months, 3 Weeks, and 2 Days," "Persepolis," and "The Band's Visit" kind of irked me. Yeah I do. And it used to piss me off, not anymore though. Well, I have not seen "4 Months, 3 Weeks, and 2 Days," "Persepolis," and "The Band's Visit" so I don't even know why it was a bit of a disappointment. It just was. I would love to see it once more to solidify an opinion about it, but who knows when that'll be. You mean the Oscars predilection for solid, competently made pictures that nevertheless don't explore all the moral complexities to the their fullest extent is news?